Thinking that you want to become a vendor? Try the Market for Yourself! 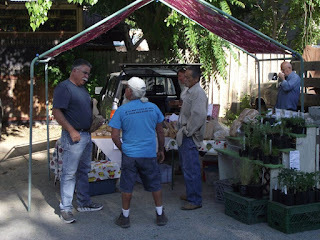 Silver City Farmer’s Market has a “Community Table” available. This is one table set up at the Farmer’s Market for eligible future vendors to try their hand at being a farmer’s market vendor. It is also available for very small growers who expect to sell out within one or two markets. All requirements apply such as, but not limited to: plants and herbal remedies are grown or wild-crafted by the seller, produce is locally grown by seller, baked goods, hot foods, and/or commodities have the proper license or permit). The Community Table is $5 for the day. Maximum use is two times before having to become a vendor with the Farmer’s Market and acquire your own stand.